Years ago, cookbooks instructed readers to cook pork until it reached a scorching internal temperature of 180 degrees. Back then, the pork chops that landed on our plates were dry and leathery, and we often used lubricants like applesauce or sauerkraut to help get them down. After more careful research, food scientists now tell us that pork is safe to eat after it reaches an internal temperature of 160 degrees. At that temperature, pork can be juicy, tender, and flavorful. pork shoulder Meat from this section is relatively fatty, which makes for juicy, tender, and flavorful roasts as well as clogged arteries. pork loin This is where we get the leanest and most tender pork cuts. Since they're lean, these cuts tend to dry out if overcooked. 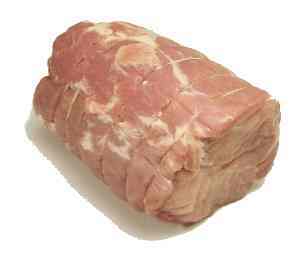 Pork is safe to eat if it's cooked to an interior temperature of 160 degrees. There are three main parts of the loin: the blade end, which is closest to the shoulder and tends to be fatty; the sirloin end, which is closest to the rump and tends to be bony; and the center portion in the middle, which is lean, tender, and expensive. miscellaneous pork cuts These cuts come from all over the pig.